Due to rapid growth and the need to build operational capacity, Interstate Specialty Products (ISP) has embarked on a Lean Manufacturing Journey to expand upon the Lean initiatives that have been taken during the past twenty years. ISP has prided itself on providing excellent customer service and product throughout its 50 years of business. With ever-changing technology and evolving customer requests, it is important to ISP to be able to adapt quickly to change and remain competitive to provide customers with the best possible product. As a recent recipient of the Massachusetts Workforce Training Grant, ISP has begun its journey of enhancing Lean Manufacturing practices. The grant program is funded by a Workforce Training Fund Grant from the Commonwealth of Massachusetts under the Executive Office of Labor and Workforce Development and is administered by the Commonwealth Corporation. 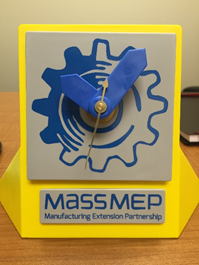 ISP is working with MassMEP, who is known as an expert resource and organization in the Commonwealth that assists manufacturing companies with their growth and training. MassMEP will work with ISP to provide full training sessions in different areas of Lean Manufacturing. ISP began their Lean Manufacturing Initiatives on March 3, 2016 with an intuitive program called Lean 102, which included an introductory course comprised of Lean concept training and simulations. The ISP shipping dock transformed into a teaching space for a day, where the team went back and forth between a classroom learning environment and four stages of simulations in a clock factory. With an added bonus of team bonding, ISP employees learned about the eight wastes, elements of 5S, visual management, takt time, and Kanban, and further applied their new knowledge in four stages of a clock factory, becoming more efficient at each stage. The training was extremely successful, and was a great way for the ISP team to begin their Lean Journey. Subsequent training and events will include Value Stream Mapping, Kaizen events, and Job trainings. These trainings and programs are aimed at increasing job satisfaction through continued learning, and enabling all employees to have personal growth in their career. As ISP grows with the changing economy, employees are able to identify areas that can be enhanced throughout the business with their continued learning, growth and training. These added benefits for the company and the employees will allow for ISP to improve its competitive advantages, and allow for lower lead times and enhanced customer relationships. Stay tuned for more updates about ISP’s Lean Journey, and changes that are being made to work smarter on a daily basis! Older →What’s the Right Tooling for Custom Die Cutting?